MAKATI—A few days prior to the 5th Regional Comprehensive Economic Partnership (RCEP) ministerial meeting to be held in Manila this week, various civil society groups and social movements voiced out in a dialog with the Philippine trade officials their staunch opposition to the proposed free trade agreement. “RCEP is not a partnership of equals. It is a ruse to perpetuate social and national inequalities in the region by further opening up the economy and human and natural resources of underdeveloped countries like the Philippines to monopoly control by advanced industrial countries and their corporations. 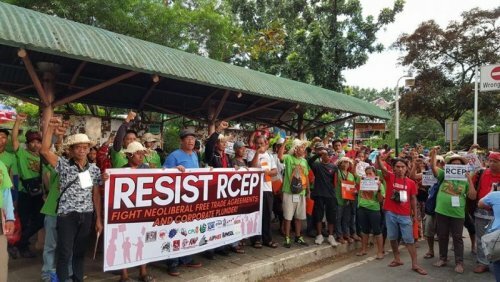 We demand the Philippines’ withdrawal from the RCEP and similar free trade agreements as they imperil our national economic development, peoples’ rights, and sovereignty,” said Audrey de Jesus of Ibon Foundation. The civil society stakeholders’ engagement on RCEP organized by the Philippine Department of Trade and Industry (DTI) held on Sept 4 at the DTI Board of Investments Penthouse in Makati was intended to provide information on the country’s RCEP negotiating team’s priorities and updates on the progress of the talks. DTI Undersecretary Ceferino Rodolfo led the briefing after which civil society representatives delivered their concerns. “Beyond dialog, we demand for greater transparency and public debate on RCEP. The veil of secrecy surrounding the negotiations makes it difficult for us to conduct independent analysis, engage policy makers, and inform our constituents who stand to be most affected by its outcomes”, according to Ivan Enrile of People Over Profit. Public access to RCEP’s text and negotiation proceedings is even more imperative given the stakes involved and their potential impacts and consequences. The controversial investor-state dispute settlement (ISDS) mechanism in RCEP for instance has been much criticized by civil society and people’s organizations as a way for transnational corporations to challenge government regulations and policy actions that they may deem as conflicting to their right to profit, and to claim taxpayers’ money. “Concrete experiences of other countries that have agreed to an ISDS clause in their free trade agreements and bilateral investment treaties have shown that an ISDS mechanism would embolden corporations to push back the historical gains achieved by the people through their collective action, such as minimum wage, security of tenure, 8-hour work, and the right to form unions”, according to Rochelle Porras of Ecumenical Institute for Labor Education and Research (Eiler). Responding to assurances made by Philippine trade officials to include mechanisms to prevent potential abuses of ISDS by corporations, Melona Daclan of Defend Job Philippines said that “ISDS, even with reforms, remains a tool for big business to threaten governments for exercising their right to regulate. The fact remains that these ISDS tribunals remain available only for corporations to sue governments, and not vice versa”. For farmers, RCEP could have disastrous impacts on smallholder farmers and food producers, according to Antonio Flores of Kilusang Magbubukid ng Pilipinas (KMP). “As a poor farmer myself, I have experienced myself how liberalization has led to the loss, not only of livelihoods, but the breakdown of families and communities as well. Alongside with other struggling farmers, I have fought against local land grabbers. With the rise of new free trade agreements, we have also been fighting against foreign investors from rich countries like China and South Korea who, in collaboration with the government, are snatching away vast tracts of our lands,” according to Flores. Dr. Jojo Carabeo of Health Alliance for Democracy (HEAD) issued a stern warning against RCEP’s negative impacts to people’ right to health. “Around 70 per cent of the domestic drug industry is dominated by transnational drug cartels. RCEP’s provisions on patent extension and data exclusivity will entrench Big Pharma’s control over the Philippine drug industry, weaken competition from generics, and make life saving medicines costly for the poor majority. The Philippines should eschew trade agreements that inflict harm on our people. Put health out of RCEP! Put health out of trade!” said Carabeo. RCEP, according to Finesa Cosico of Agham, would forfeit the country’s prospect for national industrialization. “RCEP will not bring genuine national development to the Philippines as it reinforces trade liberalization under the framework of the General Agreements on Tariffs and Trades. The Philippines experience with WTO saw little national industrial development but a continuous influx of foreign trade and investments with no support for building local strategic industries.” said Cosico. Ana Celestial of Computer Professionals Union (CPU) raised red flags over RCEP’s far reaching impacts on digital freedom and innovation. “RCEP provisions that seek to ease regulations protecting citizen as well as national data will have serious repercussions for privacy and security on different levels. Its foray into the digital domain will worsen the digital divide as provisions to protect intellectual property rights and trade liberalization in the telecommunications and digital sectors are incompatible with the goal reducing access costs to digital services and equipment,” she said. Even as the Philippine trade negotiators gave indications of points of unities with civil society and people’s organizations on key issues, the groups remained firm in their rejection of RCEP. “The RCEP does not suddenly become palatable just because of some vague assurances on demands of people’s organizations. The strong pro-corporate bias of RCEP remains even with superficial reforms and concessions,” said de Jesus. They vowed to intensify their efforts to block the RCEP through information campaigns and mass actions. “It is only our collective action that will ensure the people’s victory against RCEP and other poisonous trade deals,” according to Enrile. ABOUT PEOPLE OVER PROFIT: People Over Profit is a campaign network that unites peoples movements and NGOs across the globe to stop free trade agreements (FTAs) and corporate plunder.